The resurrection grass Oropetium thomaeum, photographed by Diana Margaret Napper. Even for a grass, the annual Oropetium thomaeum is not a very prepossessing plant. Only a couple of inches in height, it can be found as small tufts in arid or saline habitats in tropical Africa and Asia. In some parts of India, it has been recorded as a dominant grass species, probably because its small size makes it resistant to grazing while, for instance, its somewhat taller perennial relative O. roxburghianum is restricted to growing under shrubs that protect it from hungry ruminants (Gaff & Bole 1986). Despite its modesty, O. thomaeum is not devoid of interest. It is an example of what is known as a 'resurrection plant', able to survive severe desiccation in a dormant state only to apparently come back to life after rain. 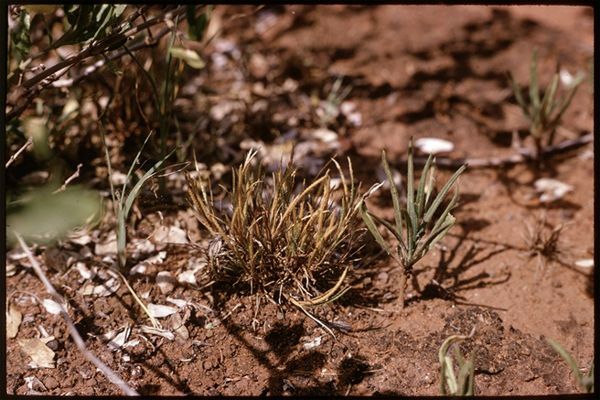 Because O. thomaeum is a diploid species with a relatively small genome (one of the smallest of all grasses), it has been touted as potential useful in studying the genetic factors controlling drought tolerance (Bartels & Mattar 2002). According to this article, it has seen some use in attempts to rehabilitate degraded environments. Oropetium thomaeum has also been shown to differ from most plant species in that it is the shoot that emerges first from the germinating seed rather than the root (Dakshini & Tandon 1970). Oropetium is a small genus of seven species of grasses in the subfamily Chloridoideae, with three species found in India and five in Africa (Phillips 1975). Despite the small number of species, members of Oropetium have been divided between no less than five genera in the past, reflecting a fair degree of disparity in their reproductive morphology. All, however, are relatively small narrow-leaved grasses forming dense tufts. Whether the African species possess the resurrective abilities of the Asian species remains, so far, unknown. Bartels, D., & M. Z. M. Mattar. 2002. Oropetium thomaeum: a resurrection grass with a diploid genome. Maydica 47 (3-4): 185-192. Dakshini, K. M. M., & R. K. Tandon. 1970. An unusual type of germination of graminaceous seed. Annals of Botany 34 (2): 423-425. Gaff, D. F., & P. V. Bole. 1986. Resurrection grasses in India. Oecologia 71: 159-160. Phillips, S. M. 1975. A review of the genus Oropetium (Gramineae). Kew Bulletin 30 (3): 467-470.